Bull markets don’t last forever; they end in bear markets and recessions. Such is the natural ebb and flow of the economic cycle. We define a bear market as a 20% or more downturn in the broad, large cap market that coincides with an economic recession. Recently, we built a macro model that has proven uncanny at timing prior bull market tops and bear market bottoms. Please refer to our model in the chart and table below. The model combines key valuation and macro factors into a historical percentile score. Note in the chart, how prior extremes in our model score signaled the broad market peak during the tech bubble in June 1999 and the subsequent market bottom in 2002. It signaled the market peak during the housing bubble in 2007 and subsequent bottom in 2009. Today, the model has given us its most extreme signal yet. It is telling us that the US stock market is overdue for a substantial bear market. The model has been warning us of these extreme conditions since September of 2016. The warning has gotten progressively more extreme over the last sixteen months. Today, 11 out of the 15 indicators are above the 90th percentile. The truth is that we are now in the most aged broad bull market in the history of the S&P 500 absent a recession. Just because the bear market has not started yet does not mean that the business cycle has been repealed or that the model is wrong. It simply means that the historic stock market and macro bubble that we are in today has only gotten bigger. It means that the looming cyclical market and economic downturn has also likely only gotten bigger as well. Tax cuts, deregulation, US-centric trade policies, and the potential for new infrastructure spending. While these all sound great on the surface and are fueling the mood behind the rise, undue ebullience over policies of a new Republican administration classically coincide with market tops. Market history is littered with downturns that followed new Republican presidents: Hoover (1929), Eisenhower (1953), Nixon (1969), Reagan (1981), and Bush (2001). The Trump bubble will likely prove to be the mother of all Republican presidential ebullience bubbles. Trade wars are not positive at all for the markets. They are what exacerbated the Great Depression and they should be one of the key triggers of the bursting of the China bubble. With the equal-weighted S&P 500 Index up 35% already since the Trump election and today’s record valuations, any potential benefits of the tax cuts are all already way-more-than priced in. Regarding corporate tax cuts, the new 21% corporate tax rate may sound low compared to 35%, but 21% was already the tax rate that the median S&P 500 company was paying on a cash flow basis. Similarly, our work shows that corporate free cash flow margins for the S&P 500 have already been at record highs. How can a 21% tax rate improve the discounted free-cash-flow (DCF) valuation model for the median S&P 500 company that was already paying only 21%? Meanwhile, with capital expensing for tax purposes, free cash flow will certainly be negatively impacted in the short run for those companies that ramp up their spending to take advantage of the tax benefits with no certain return on that investment. We also must note that a surge in corporate spending and capital investment late in the business cycle is a classic coincident indicator that signals market and business cycle tops. More negatives from tax cuts are increased budget deficits and potentially rising inflation and interest rates, macro factors that are negative for stocks. 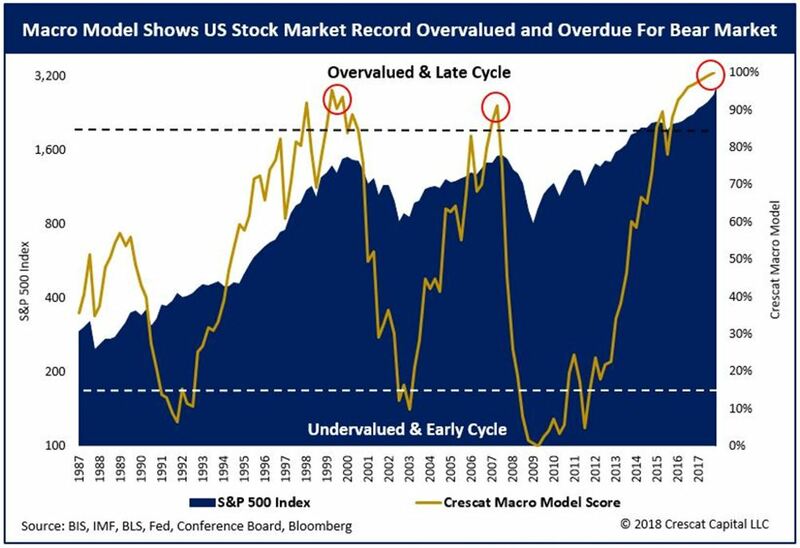 As one can see in our macro model above, the stock market tends to top out on historically strong macro data at high valuation multiples, late in the business cycle after the Fed has been tightening credit conditions. It is at these times that asset bubbles tend to burst, i.e. when prices for overvalued assets fall, whether they be stocks, real estate, or credit, and then recessions tend to follow closely behind. The start of the recession and extent of the GDP decline tends to be discovered only after the fact, once past GDP has been revised down. Such is the business cycle. As one can see in our macro model chart, from the experience of the tech and housing busts, stock markets tend to crash much faster than they rise, particularly when high debt levels are involved. Today’s global asset bubbles are arguably the biggest in history because global debt to GDP is the largest ever. 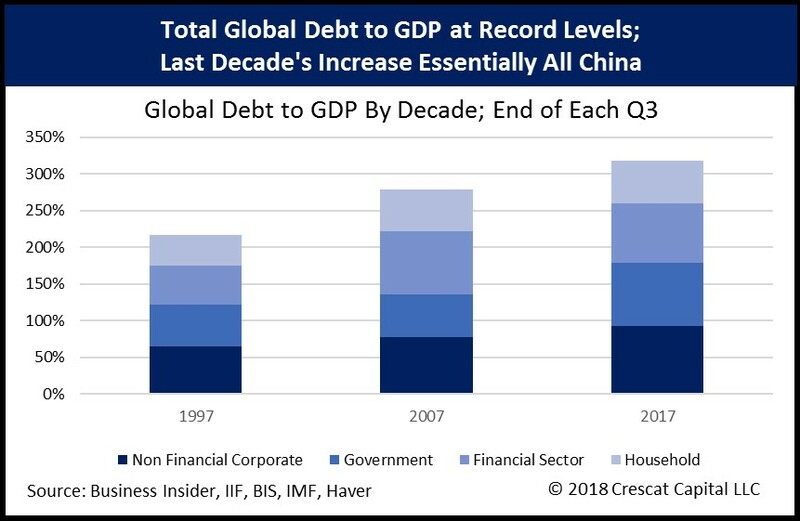 In the last decade, we largely have China to thank for the surge in global debt and the unsustainable overall leveraging of global debt to GDP which leads to financial crisis. As we have thoroughly shown, we believe China today is the biggest macro bubble in recorded economic history. Market participants should not confuse bogus reported levels of Chinese GDP growth with real synchronized global growth. We have shown that the Chinese credit bubble is poised to burst along with related credit bubbles in Asia, Australia, Canada, and the US. The bursting of the China bubble will almost certainly be globally contagious, so seeking haven from expensive US stocks in foreign stocks that appear only slightly cheaper, could prove a costly value trap today. The beauty of the fact that these bubbles have not burst yet is that investors can still do something about it today. We strongly believe that now is not the time to buy most stocks. They are over-crowded and record expensive. If one is too heavily long US stocks or long just about anything that has to do with China, one can sell now. And if one is an aggressive value investor, within the bounds of reasonable risk constraints, and wants to capitalize on the downturn, one should be selling short now. Playing the late-cycle momentum game is not Crescat’s style at all. Our style is to get short bubbles like these with the goal of delivering substantial absolute return and substantial outperformance compared to the market and other managers. We are confident that we will succeed. Our long-term track-record, particularly at identifying and capitalizing on the US housing bust, provides strong evidence that we can. See the charts of our performance during critical market times further below. Our goal is to capture outsized value-driven returns over complete business cycles. We employ short-selling in our hedge funds to capitalize on market downturns. 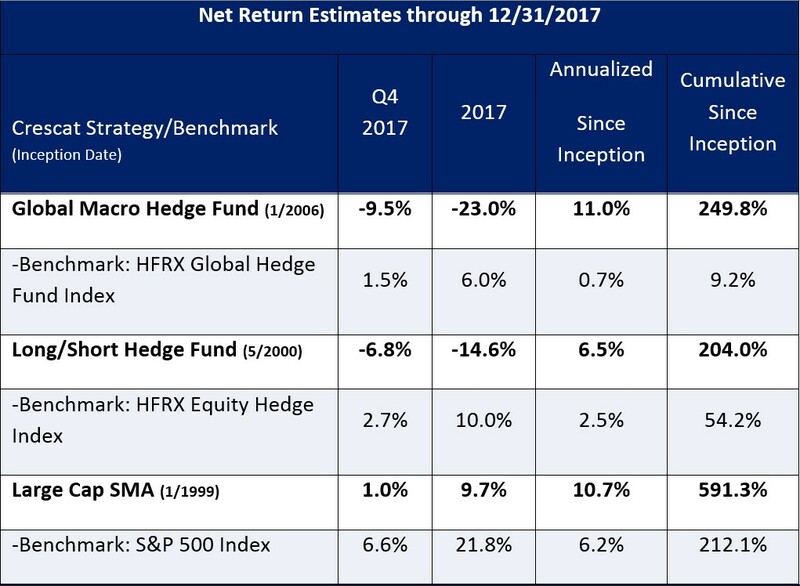 Because we have been net short for the past year based on our macro model indicators, our hedge funds have been in a drawdown. The bubbles that we have been justifiably shorting have only gotten bigger. We have been following our risk controls to contain the drawdowns but they are still not fun. Across all of our strategies, we have been through drawdowns before and have recovered substantially from them to produce strong risk-adjusted returns throughout full business cycles including award-winning returns in Crescat Global Macro Fund and Crescat Large Cap in particular. We strongly believe that the recent drawdowns are unsustainable, because a bear market is looming based on our indicators. We believe our positioning will be vindicated. We think the next twelve months will be one of the best shorting opportunities in Crescat’s history. It should be like shorting tech stocks in 2000 or financials in 2007 as we did successfully in our hedge funds in the past. But it will almost certainly be better, because today’s global asset bubbles are the biggest and broadest yet. Even after our recent drawdown in December, based on 133 rolling twelve-month returns, Crescat Global Macro Fund has had positive returns 71% of the time averaging 25.9%, and negative returns only 29% of the time averaging a loss of 11.8%. The average gain has been 2.2 times greater than the average loss and the gains have happened 3.4 times more frequently. 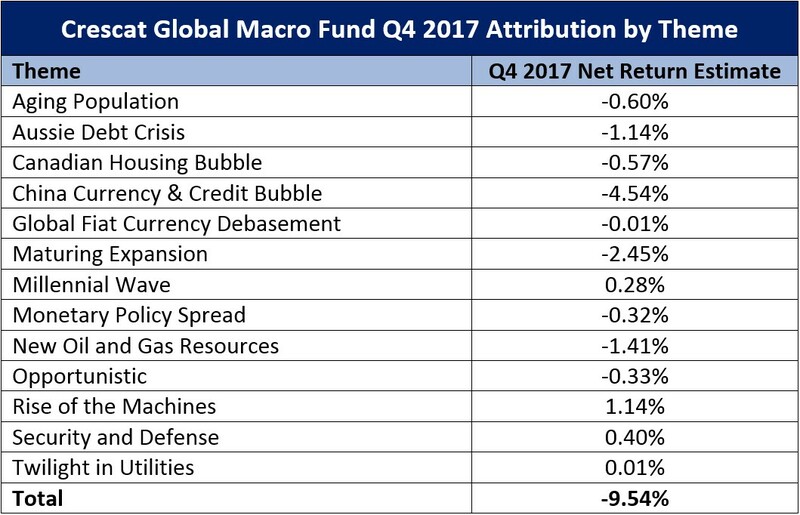 Importantly, below is a table showing how well the Crescat Global Macro Fund has performed historically after drawdowns. Please note that we have tended to do better going forward after our worst drawdowns. Case studies are included for informational purposes only and are provided as a general overview of our general investment process, and not as indicative of any investment experience. There is no guarantee that the case studies discussed here are completely representative of our strategies or of the entirety of our investments, and we reserve the right to use or modify some or all of the methodologies mentioned herein. Only accredited investors and qualified clients will be admitted as limited partners to a Crescat fund. For natural persons, investors must meet SEC requirements including minimum annual income or net worth thresholds. Crescat funds are being offered in reliance on an exemption from the registration requirements of the Securities Act of 1933 and are not required to comply with specific disclosure requirements that apply to registration under the Securities Act. The SEC has not passed upon the merits of or given its approval to the Crescat funds, the terms of the offering, or the accuracy or completeness of any offering materials. A registration statement has not been filed for any Crescat fund with the SEC. Limited partner interests in the Crescat funds are subject to legal restrictions on transfer and resale. Investors should not assume they will be able to resell their securities. Investing in securities involves risk. Investors should be able to bear the loss of their investment. Investments in the Crescat funds are not subject to the protections of the Investment Company Act of 1940. Performance data represents past performance, and past performance does not guarantee future results. Performance data is subject to revision following each monthly reconciliation and annual audit. Current performance may be lower or higher than the performance data presented. Crescat is not required by law to follow any standard methodology when calculating and representing performance data. The performance of Crescat funds may not be directly comparable to the performance of other private or registered funds. 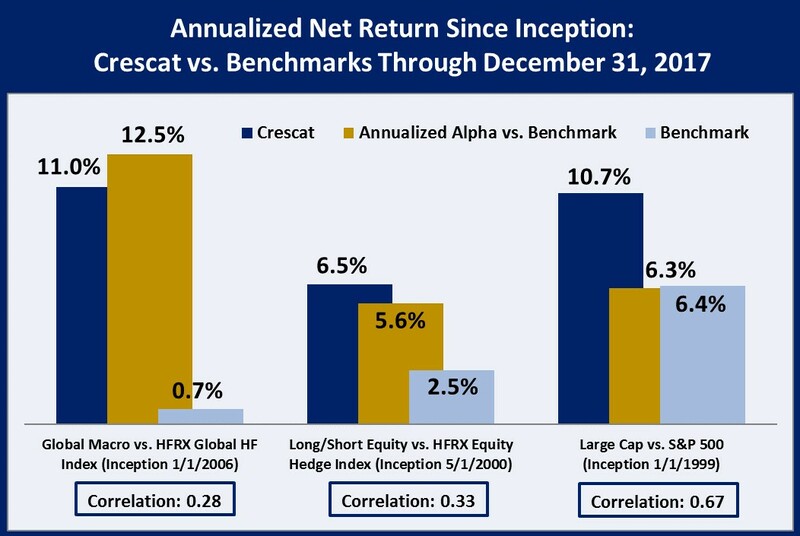 Investors may obtain the most current performance data and private offering memorandum for a Crescat fund by contacting Linda Smith at (303) 271-9997 or by sending a request via email to lsmith@crescat.net. See the private offering memorandum for each Crescat fund for complete information and risk factors.